When the ball reached 50-overs old in India's first innings, James Anderson had somehow bowled more than a third of the overs in a five-man attack: 18 of the first 50. It was a wicket for clever, skillful bowlers, and Alastair Cook had to keep going back to Jimmy. It was in his 17th, with an older ball and a set potential superstar at the other end, that Anderson took his second wicket. Cook was right to use overuse him. Many times he has been right to overuse Jimmy. Like at Trent Bridge last year, when England only won the Test because Anderson bowled until his soul bled out of him. Anderson was England's Man of the Series against Sri Lanka, and Man of the Match at Trent Bridge against India, largely due to his batting. Yet, none of the four previous Tests this summer were anywhere near his best. He's bowled too short too often, and his aversion to bowling at the stumps has frustrated many. Those four Tests were preceded by nine of the worst of his career. It was like that long spell of bowling in Nottingham never ended. The four Tests after that in the 2013 Ashes, he was barely a factor. And in Australia, at times he would take early wickets, then Brad Haddin would come in, Anderson couldn't muster up another special effort and England were done for. It was at its absolute worst at the WACA. Stuart Broad was off injured, Australia already owned the game. Anderson had to bowl, and he did it well enough to take the edge of Chris Rogers. Matt Prior and Cook both made a mess of it. Then Australia just annihilated Anderson, the final slap was from George Bailey, who might as well have broken Anderson's arm. But Anderson wasn't finished by Bailey. He might be a grumpy SOB at times, but that has its advantages and he has worked hard at getting back to his best. It has been slow, and he has not always been a match-winner this summer, but he was at least a factor. Here, he had the advantage of a couple of extra days off as England batted. He had the advantage of scoreboard pressure for only the second time in over a year. And he also had the motivation, as he may not be playing the next match. At almost every single opportunity in this match, Anderson moved his team towards victory. 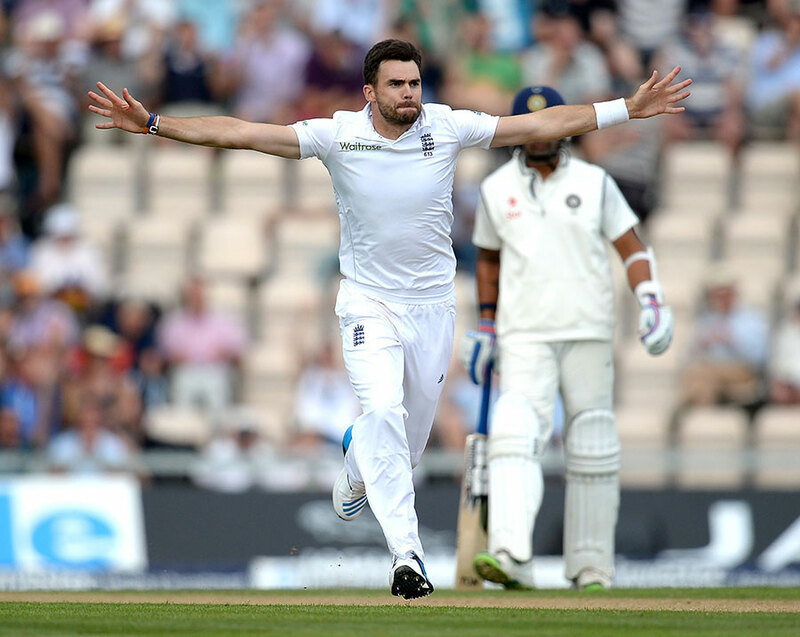 His wicket of Shikhar Dhawan before stumps ended England's perfect first two days well. His wicket of Virat Kohli - in his 17th over, with the old ball - continued their stranglehold of him and ended India's strongest-looking partnership. His wicket of Ravindra Jadeja ended any chances of a Dhoni-Jadeja happy-slap rearguard funfest. His wicket of MS Dhoni ended the chance of one of those annoying tail partnerships England have been so useless at dealing with. And he ended all hopes of an Indian draw with the final morning wickets of Rohit Sharma and Dhoni. Had India not queued up to jump off the Moeen cliff, he probably could have finished with a ten-wicket match haul. But, for once, he wasn't needed. And England and Anderson looked better for it. Instead of worrying about overusing Anderson next Test, England may be worrying if they'll get to use him at all. That is for another Australian, the judicial commissioner Gordon Lewis, to decide on Friday.